Winning Transfusion crew - photo by Alexandra Earl. Rod Jones’ one design comeback with his new Farr 40 called Kindergarten scuttled the familiar finish order of Transfusion then Kokomo, who are both long-standing Farr 40 classmates and pacesetters. 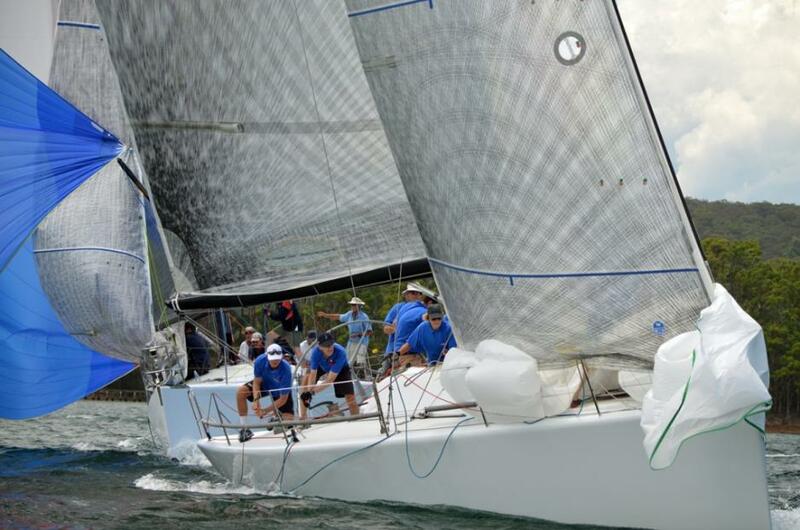 Instead it was Transfusion (MHYC) then Kindergarten thanks to a “blinder” on debut by Jones and his mixed NSW and Queensland crew of a third and two firsts in the final three races of the Farr 40 One Design Trophy Pittwater on Sunday December 7, 2014. Lang Walker’s Kokomo (CYCA) ended up third overall, one point behind the class newcomer. 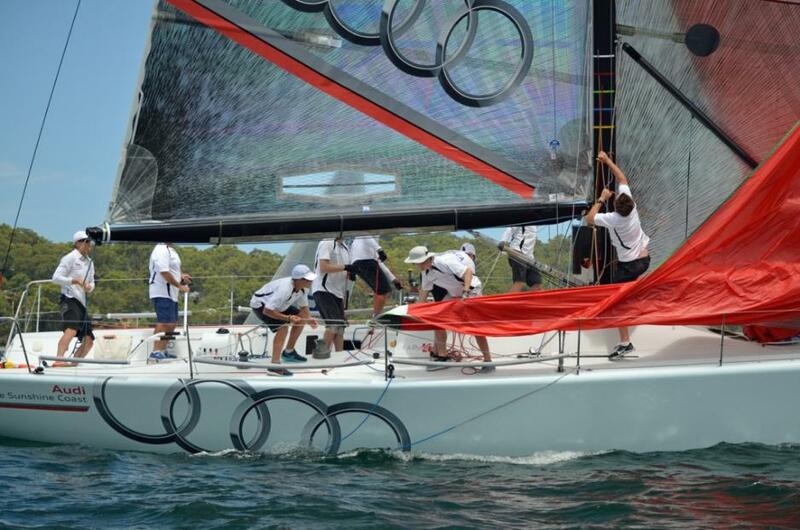 Kokomo’s fifth in race four allowed Jones, a two-time Audi IRC Australian champion with previous boats, to slip into the runner-up position Walker and his quality crew held at the halfway point. 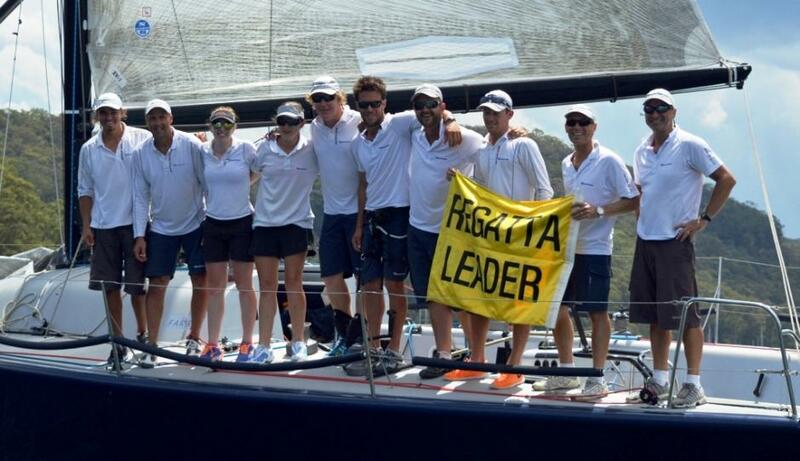 Regatta winner by three points, Guido Belgiorno-Nettis, the owner/skipper of Transfusion, paid tribute to his tactician Jordan Reece and strategist Katie Pellew-Spithill who teamed up for the first time in their new roles. “The two of them worked so well together. I love sailing these waters, it’s just so tricky with 20 degree wind shifts everywhere,” added the delighted boss. International Farr 40 one design rules dictate an amateur owner must helm their own boat, to prevent owners spending up big to secure professional drivers. Another steamy summer’s day on Sydney’s picturesque northern beaches produced a light and flicky nor’easter 8-9 knots for the late morning opening race, winding up to 16 knots in the closing stages. Transfusion is actually an ex-Kokomo Farr 40 now owned by Rob Reynolds and the foot chocks that help the steerer set a good height and have a clear view out of the boat are “built for a giant” says Belgiorno-Nettis, who borrowed the Farr given his is still in transit from the class’ recent world championship. “It was good to be on a different boat, the only thing is the chocks aren’t made for a vertically challenged man,” he joked. Kindergarten’s underdog tag has again proved a misnomer. It’s become Farr 40 folklore that another previous owner, Ivan Wheen, once sailed with an L-plate tied to the stern rail then went on to score highly in that particular series. Jones says the L-plate yarn “was the catalyst for naming his new Farr 40 Kindergarten, plus it’s a reality check for our egos and we think it shows respect to the guys who have been in the class for a long time. Another owner on debut this weekend, Bob Bennett and his Farr 40 Enigma from RPAYC took out the Corinthian division which allows teams to race with two ranked professional sailors versus the professional category which permits up to four pros among the usual 10-strong crew. Corinthian winner Enigma - photo by Alexandra Earl. Above: Transfusion (left) and Kokomo - Below: Kindergarten 2nd overall - both photos by Alexandra Earl.